﻿Need thinner lenses?﻿ Need them for the computer? We've got it all . . .
See how photochromatic lenses darken and fade back to clear to provide continual visual comfort and protection. Sun damage is a possible link to eye conditions such as cataracts and macular degeneration. Long-term U.V. exposure can also cause pinguiculum and pterygium growths on the surface of your eye. These are generally harmless but unsightly - think of them like a callus on the surface of your eye. We recommend U.V. protection for everyone, including children. Come see our selection of sunglasses any time! Or, if you prefer no tint, U.V. 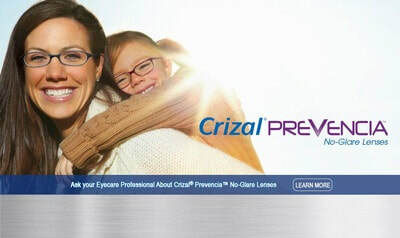 protection is available in clear lenses.